Oh my, is it Thursday already? I feel like I’m only just barely recovered from my two-day stint at Stitches East. I should say up front that it was a BLAST helping out at at Kate’s booth for A Hundred Ravens. I drove down with Donna and about half the booth stuff on Thursday for setup, and then Lauren and I left Friday and stayed the rest of the weekend. We described ourselves variously as booth babes, helper monkeys (my favorite), groupies, and ? ?probably other things too?? :). The booth was beautiful and inviting, and we had lots of traffic. 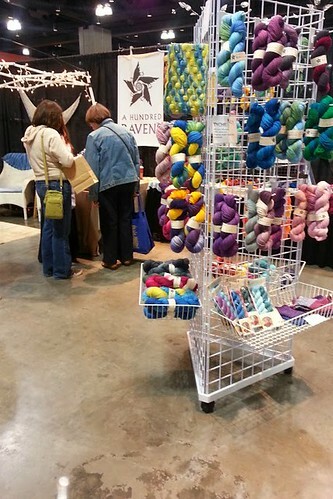 It was so fun to meet all the shoppers, many of whom had never seen Kate’s yarn before! What a pleasure to share my love of the colorways of A Hundred Ravens. Because there were three of us staffing the booth, everyone got to steal away for a little bit from time to time. Armed with my shopping list and a map of the show floor with certain booths highlighted, I was able to get around to everything I wanted to see. 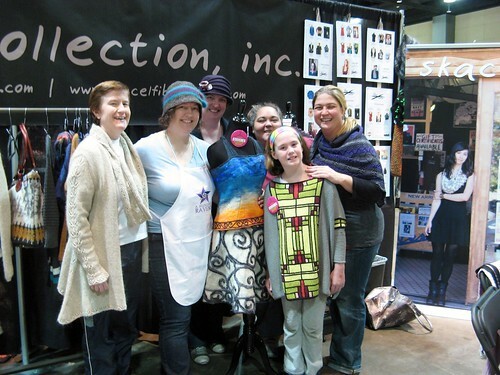 I was especially excited to visit the Skacel booth, which featured the designs from The Fiber Factor. I visited my things, and chatted with Cirilia and Jodi. Both are lovely & delightful — so glad to meet them in person. Jodi almost let me steal my hat, but that would have been wrong. Besides, I already have yarn to knit one for myself! Once or twice someone visiting the booth recognized me from the show — that was cool! I also got to check out the other contestant’s designs in person! It was great to get my hands on them and see the answers to questions I’d had about construction and technique :). This same awesome group of friends stayed until the end of the day on Sunday, and then helped Kate, Lauren, and me break down the booth in record time. Kate and I pulled into the loading dock line as the 2nd and 3rd cars, and still had to wait 20-ish minutes before entering the building (did I mention we got to drive inside! whee!). By the time we had packed the cars and headed out, the line was at least two dozen vehicles long … HOURS of waiting, no doubt. ← Winter Beach Pattern — Now Available! What a fun time you had! So glad I got to meet you in person after meeting virtually. 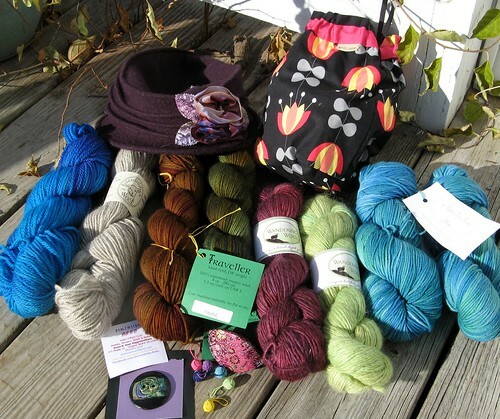 Love the photo of the Fiber Factor knits! I wish we had something like that here, what fun. I loved seeing all you fiber factor knits. I have to say I loved all your designs and have allready downloaded all the instructions that were available and have purchased the yarn, now I just have to get knitting.